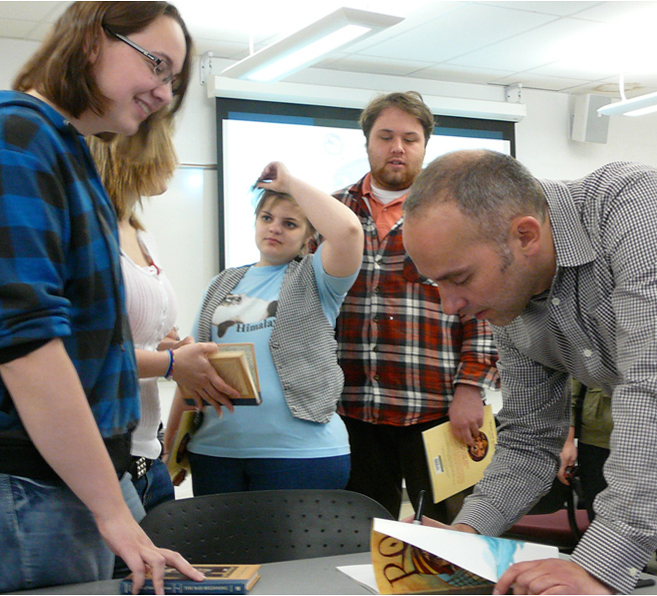 Brett Helquist signing a book for Kimberly Beyer, illustration student. Brett Helquist, illustrator, visited Kutztown in April during the 2010 KU Children’s Literature Conference. Best known as illustrator for Lemony Snicket’s A Series of Unfortunate Events, Brett Helquist’s personal success story sounds like a series of fortunate events. He grew up in the tiny red-dirt town of Gonado, Arizona. While he was studying at Brigham Young University in Utah, his one elective art class led him to change his major from Engineering to Art. There he met NY-based illustrator Robert Neubecker. Neubecker, an avid skier, came to BYU as a visiting artist, in part, because of its proximity to world-class skiing. Helquist eventually moved to NYC and Nuebecker offered him an internship. Helquist fondly recalls the moment he stepped off the plane in New York and he felt the city’s amazing energy, something he had experienced just once before on a mission trip to Hong Kong. He found work as a production artist for Martha Stewart Living and freelanced illustration on the side. His client list grew to include Ranger Rick and The New York Times. Then one day he got a call with an offer to illustrate a book by an unknown author with the unlikely name of Lemony Snickett. This was his first book job ever, and the rest, as they say, is history. Helquist has since illustrated many books, including Milly and the Macy’s Parade, and a picture book version of Dicken’s Christmas Carol. He wrote and illustrated Roger the Jolly Pirate. He generally works in oil paint on watercolor paper. 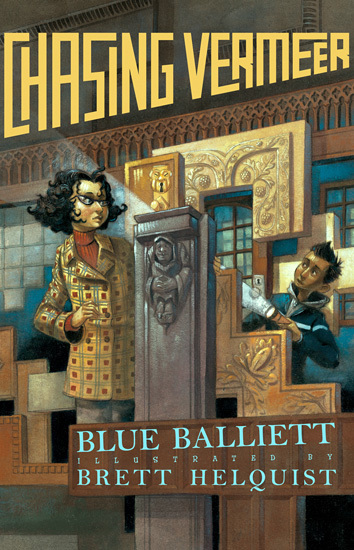 He shared with students the architectural photo reference he personally shot in Chicago and many, many preliminary sketches that led to the cover art for the book Chasing Vermeer. Upcoming projects include illustrating a book by the legendary Neil Gaiman, entitled Odd and the Frost Giants.